DARAA, (DNA) – The Syrian government and its Russian ally pounded rebel-held areas of the southern province of Daraa on Thursday with the heaviest air strikes of a two-week-old offensive.”Hundreds” of missiles and barrel bombs were unleashed before dawn by both Syrian and Russian aircraft, after talks on rebel surrenders broke down on Wednesday, the Syrian Observatory for Human Rights said. 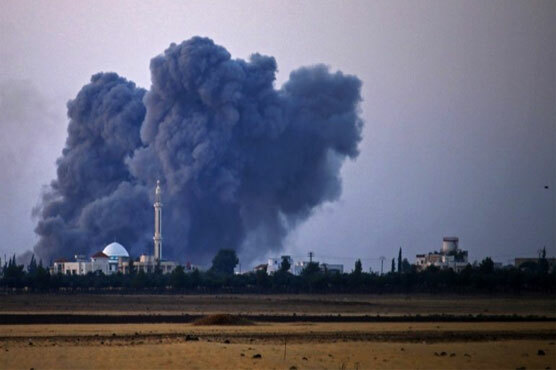 the edge of the rebel-held south of the city of Daraa, the divided provincial capital, said the bombing of rebel neighbourhoods was the most intense since the launch of the Russian-backed offensive on July 19. Damascus has unleashed similar bombardment of rebel-held towns elsewhere in Syria in the past that have delivered negotiated surrenders which allowed it to retake swathes of territory.